It was more showbiz than election hustings as Lee Jasper and George Galloway took to the stage at Crystals night club last night for the official Respect party launch ahead of the Croydon North by-election on November 29. And while that election date may come too soon for the small political party, local council elections in 2014 are clearly also on the agenda for Respect, as it was announced at the meeting that they intend to field candidates for Croydon Town Hall. On their election banners, Jasper and Galloway pose like the Blues Brothers. Perhaps they’re hoping that if Jasper does not win enough votes to join Galloway at the House of Commons then, with their designer label black-rimmed glasses, they will have a good chance of winning a contract to appear in ads for Specsavers. Just like Croydon’s Fairfield Halls. There’s no two ways about it: Galloway was at the top of the bill for this show. He also appeared on all of Jasper’s election material last night. 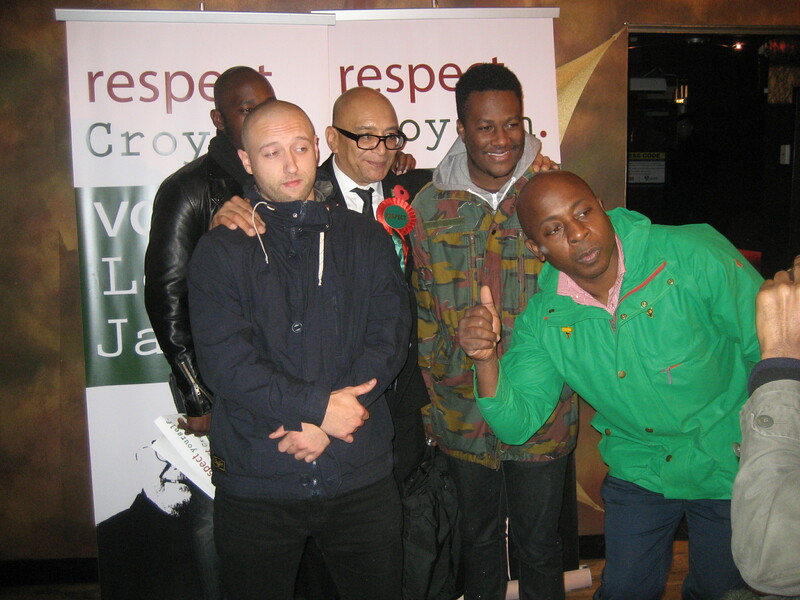 Other figures from show business, such as Vas Blackwood, of Lock, Stock and Two Smoking Barrels, and rapper English Frank, also made appearances to vouch their support for Jasper. Blackwood saw Jasper as Britain’s Obama. English Frank gave a thoughtful speech about engaging young people in politics not gangs. Chris Goldfinger, the former Radio 1 DJ, provided the post-rally party music, though by that stage of the evening, our intrepid reporter had made his excuses and left. Galloway was, as ever, a mesmerising purveyor of rhetoric and the star the enthusiastic audience had come to see. He had already delivered speeches in Manchester and Rotherham that day for other Respect by-election candidates. The question that neutral observers wanted the answer to, though, was whether Respect really did have the momentum to challenge Labour in Croydon, as they had done successfully in Bradford. A poster for Respec’ Savers? Galloway’s message was that Labour is trying to mislead the electorate into thinking it is between them and the Conservatives. Labour beat the Conservatives by 32 per cent margin in the seat in the 2010 General Election. The two-horse race that Labour are talking about might suggest that they are riding Frankel and could win by a furlong. Galloway had a go at Chuka Umunna, MP for Streatham, for repeating the Labour line that Respect are not serious challengers, saying that another horse is coming up on the rails to challenge the odds-on favourite. “When Chuka said that it was a two-horse race, he meant to fool people into believing it was between New Labour and the Tories. It is a two horse-race Chuka… it’s us against you,” Galloway warned, delighting his 80 or 90 supporters in the night club venue. Jasper admitted that he has only 40 active campaign workers in the constituency and that he desperately needs 200 more to make a real impact at the polls in the 18 days left to election day. In Crystals, there seemed to be only a smattering of locals, but plenty of aid coming from battle-hardened Bangladeshi Respect campaigners from Tower Hamlets, brought in to buttress the campaign. Two Respect offices have been opened in Croydon now, but Jasper betrayed a lack of real local knowledge by repeatedly referring to one being in “Boo-lah”, rather than using the “Bewlaa” pronounciation favoured by those who actually live in the Beulah Hill area. A long-time community leader in London, Jasper told Inside Croydon that his Mancunian accent was preventing him getting his tongue around the unfamiliar place name. Gifford Sutherland was the only speaker on the night with a local connection. Sutherland’s Foundation4Life works on diverting young people away from crime. Sutherland hinted at why a non-mainstream party might be relevant in what Croydon has become in recent years, a community scarred by a huge gulf in prosperity between parts of the borough. Sutherland described Croydon as “polarised and among the most deprived in London, with no investment and disparity in the level of care between the north and the centre and the south of the borough that comes as a default position of the council”. The Respect speakers said that Croydon North has the biggest population of young people in the country (Croydon North is the second biggest seat by voter numbers in the country in any case) and Sutherland felt that Jasper engages well with young people. Brixton resident Jasper also received a powerful endorsement from George Ruddock, the editor of black newspaper The Voice. Ruddock said the Croydon North election has “all the hallmarks of another upset”, and that a Respect victory would act as a pointer to a healthier democracy, where no parliamentary seat was safe and voters were no longer taken for granted by the two major parties. Ruddock extolled Jasper’s record as an “anti-racist”. But Galloway and Jasper were keen not to be typecast as appealing only to particular minority ethnic communities. Jasper said that his family had first come to Britain in 1896 and that he felt confident in his Britishness. He had not come to Croydon to divide communities but to unite them in tackling their common problems. He placed an emphasis on the needs of the working poor and the white working poor in particular. None of this was very radical. You almost felt that someone was going to mention “One Nation” at any moment, the Disraelian slogan recently adopted by Labour. 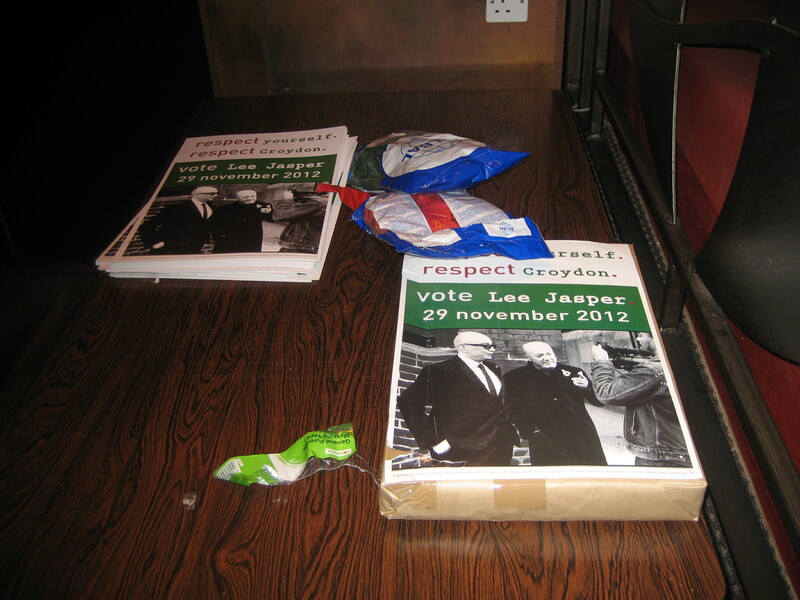 If Respect is to distinguish itself from the established parties, the message was, it would be to send out a message that, post-riots, the people of Croydon were demanding attention. Jasper, they suggested, being from an ethnic minority background, has more in common with the Croydon North electorate, and unlike other candidates, he would be prepared to cut military spending and withdraw from overseas conflicts in order to fund local domestic services. “Elect Steve Reed and no one will notice,” Galloway said of Labour’s candidate, the council leader in Jasper’s home borough of Lambeth. Jasper spoke of the working poor unable to pay the rent despite stitching together a number of lower paid jobs. He spoke of the London Road businesses still awaiting Riot Act compensation, claiming that, “Boris will write the cheques the very next day, if I am elected”. Jasper wanted to see Croydon North’s working poor benefit from a transfer of the many billions that could be saved by cancelling the Trident nuclear missile replacement. In Jasper’s view, violence in foreign policy taught young people that violence was a weapon that could be used on the streets. Jasper decried Reed’s co-operative council model as little more than empty rhetoric and policy papers with fancy colour photos. Galloway put Reed on notice that he’d make the Labour man’s record an issue in the election. “He hopes Croydon is far enough away from Lambeth that his reputation will not follow him. But I’ve got news for him. It’s already here and we’ll spend every day and night telling the people of Croydon North that if you elect this guy, not only will no one notice but nothing that is a problem here will be resolved,” said Galloway. Galloway could not understand how Croydon Labour’s party members, many of them black or Asian, had selected Reed as their candidate. “They had all kinds of minorities in this constituency to choose from. They could have chosen an Asian candidate. They could have chosen a Muslim candidate. They could have chosen one of two or three black candidates. But they chose the white guy, as they normally do. For Jasper this also seemed to be a personal mission against elements of the London press – the Evening Boris in particular when edited by Veronica Wadley – who had run a campaign against him during his time as an advisor to Ken Livingstone when he was Mayor of London. 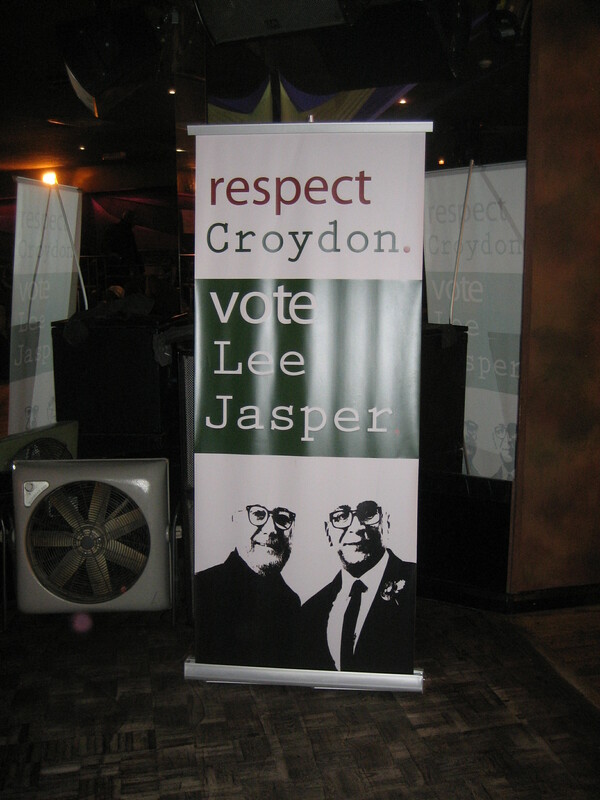 Jasper reminded the audience that none of the accusations that had been made against him had ever been proved true, and that he was not the only person in Croydon politics who had been subject to attempted destruction by media. He compared his treatment with the Evening Boris‘s lack of interest in corruption in Parliament and at the Met. In terms of actual policies, Jasper seemed a little light at this stage of the campaign. He wants votes for 16-year-olds and for youth clubs funded from assets seized from criminals. He would push for riot compensation to be paid out and he’d lobby schools to be open for the community from 6am to 10pm, in an effort to take young people off the streets. He said he also wants to improve cycling facilities. We will discover on November 30 who the electors choose to send on their bike. This entry was posted in 2012 by-election, Croydon 8/8, Croydon North, Lee Jasper, Steve Reed MP and tagged Croydon, Croydon North, Galloway, George Galloway, Jasper, Labour, Lambeth, Lee Jasper. Bookmark the permalink.